This is a really delightful book, would recommend for any age. 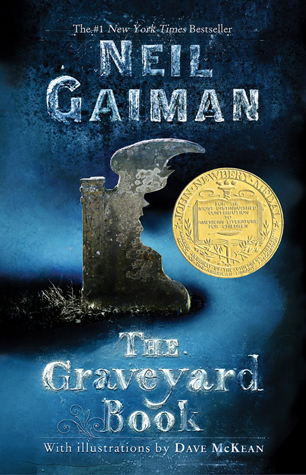 Gaiman always strikes me as a bit of a balance: always clever, inventive, sometimes a bit cute, sometimes a bit gothy (for lack of a better way to put that), always a bit meta-interested in story, and I sometimes feel like he's about 2 degrees of tilt from going too far in any of those directions. This is one is perfect. Charming, but not cloying. Surprising, without feeling like it was manipulated to be so. Gaiman's core story and characters here are deft and natural-feeling, enough so that he can quietly insert some jokes (like the classic mummy/vampire/werewolf mashup, or the Jacks) without abrading the reader. The detail-work here is delightful, setting up a whole atmosphere of calm, shot through with vivid little snippets and a kind of horrific-comic tone, or comic-horrific, that might be Gaiman's signature move: in anyone else's hands it would collapse into Burton-esque vaudeville, but here the innocence of the protagonist, and the general plain goodness that surrounds him, allows us to run into murderers and monsters, ghouls and night-gaunts, in a way that keeps the horror, delighting fantasy, and quiet humor running simultaneously. Structurally, the novel is also about three quarters of the way to a fix-up--many of the chapters could sort-of kind-of stand on their own--while preserving an overall arc and a satisfying ending. It strikes me as an unusual thing to see done well: the story neither loses its place nor feels like it's rushing you anywhere in particular. Following a child both closely and believably from age 2 to 17 or so is also quite a trick. It's scattered throughout with ringing little lines and phrases, without feeling flowery or distracting. Really a beautiful read, a pastiche-free homage to childhood and reading itself.